I just did my mini Terminal 5 guide last week forgetting that I was going to be there again just 3 days later! I was trying to be so good at keeping my Mom’s 70th Birthday surprise party in Florida a secret I kind of hid it from myself. All of a sudden the big weekend had arrived and I was off to the airport again, this time jetting out to West Palm Beach where my Mom’s cousins reside. Once again Mr. T and I got to the airport with just barely enough time to get some lunch. We really want to see if our bad showing a 5ivesteak over Christmas was just a fluke. The first time it had been so good! So we ordered the same exact dishes as the first time. 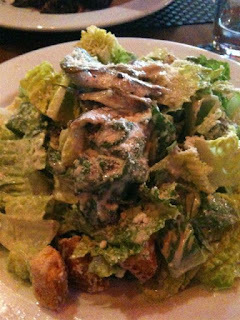 I got the Caesar Salad. I had forgotten to ask for no anchovies but I just took the little buggers off. This is a huge and tasty salad for $10 and I barley got halfway through it before I was too full to continue. I was probably so full because I kept grabbing some of Mr. T’s dish the Crispy Chicken. 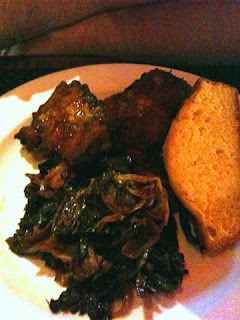 Two big pieces of fried chicken in a marmalade sauce with sauteed spinach, bacon onions and sweet corn bread. Moist inside, crispy outside and with that awesome sauce! We were both so happy. It appears the Christmas experience was just a bad showing. These dishes were both great and quite a step up from your average airport food. Now the only thing they have to work on is the service. We waited about 15 minutes to get a menu and then our drinks stayed on the bar for 15 more before our waitress even noticed. It took so long that we actually were the last ones to board our flight! Luckily we made it safely to Florida and had a fabulous time with family. My Mom was so surprised I thought she might pass out! She thought she was just meeting her cousins for brunch when my brothers and I, her brother and sister-in-law from Tennessee and Mr. T walked out! It was so fun to see her face and to be able to be there with everyone to celebrate. 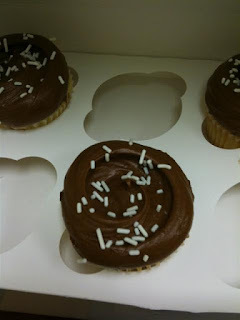 I even brought some treats down for everyone- Magnolia Cupcakes! I stopped at the new Grand Central location right before I left and cleared them out. It’s nice to have another location with no line. All in all a great trip!